How do I fix “Failed to sync vcpu reg” error? and the emulator won't run. The significant part of this error (Failed to sync vcpu reg) is not mentioned ANYWHERE online, except in the source code for the HAX itself, but I can't figure out how to make any sense of this. Can anyone advise about how to get past this error? I really need to get this working, because debugging on device and in the default emulators is painfully slow. Make sure you don't have any virtual machines running. In my case, I had genymotion running which was causing this error. I had virtualbox running. Killing the VM allowed allowed the emulator to run. I had this problem. For me it was the HAXM version. and run intelhaxm-android.exe manually. In my case, I had 1.0.6 and upgraded to 1.1. I think that what caused the error in the first place was that some other part of the SDK that I had updated needed 1.1. If so, kill the VBox and docker service. Stop GENYMOTION (open VirtualBox instance if any instance is running, stop it). Open AndroidStudio -> Run AVD Manager-> run AndroidStudio virtual device. "vcpu reg" are "Virtual CPU REGisters" that exist on many processors that have things like multiple cores, hyperthreading, or other features that enable higher layers to believe that there is more than one CPU present when there isn't -- such as today's x86s. No reason to go in to detail -- you can imagine that getting a coherent, single "virtual CPU context" is necessary for the kind of hardware virtualization that HAX offers. Normally, it's not a problem to run multiple virtual machines of various sorts simultaneously. But if one of them crashes, or misbehaves, or just decides to be a hog, HAX might find that it just can't put together a coherent virtual machine, because it can't sync a virtual CPU context for itself. It'd be like trying to run a real machine with no CPU. Bottom line is open task manager and kill things that you don't need and that look like they might be holding virtual machine resources. In the worst case, a reboot is almost certain to fix the problem. Stop all VirtualBox Virtual Machines (i.e. vagrant halt), quit VirtualBox. All docker-machines should be stopped, too. Quit Docker. I was getting the same error. I'm guessing there are various reasons for this error, but in my case it was because of a service named ".NCG". The service is Network Content Guard by Inka Entworks, and seems to be some type of DRM solution. Once uninstalled, the emulator worked fine using HAX. In my case, it turned out this problem was caused by having a webcam selected as "Front Camera" in the settings for the AVD. Setting it to "Emulated" fixed this problem for me. I faced this issue because I had my virtual box running with Ubuntu on it. When I shut down my virtual box I did not face this issue. I got the same error on my windows 8 install. For me, the error occurs when I try to attach a physical webcam to the emulated android instance. This kept failing until I changed it to [x] Use Host GPU as shown in pic. I'm running boot2docker vm, just down it solved the issue. Ya, i had virtual box running and was getting this error, shutting it down fixed the error. I was on a mac and had this problem. I did not think I was running a VM (I have vbox but it isn't running). I restarted my computer and before starting any other apps I tried the emulator and it works fine. Yes, VirtualBox VMs have to be stopped. I also had to stop Docker for Mac. The error message only mentions VirtualBox, which confused me a little until I realized Docker for Mac is running xhyve. If your CPU supports throttling (like Intel's SpeedStep) try to disable that feature in your BIOS. It's kind of a quickfix but at least it worked. I think it must be a variety of reasons cause this failure. In my case, since I installed the Google input method software, "Failed to sync vcpu reg" appeared. This was the one and only change before normal working. So, after uninstall the Google Input software, it was recovered.just a little reference, although I can't believe this solution for long time either. I had the Windows Virtual PC running (on Windows of course). Once I turned off, the emulator went fine. I was trying to launch a Gingerbread 2.3.3 x86 emulator and it would not launch. Changing from x86 to arm made the problem go away. For me, the only thing that worked using adv on MacOs Yosemite, is setting the processor to ARM (native CPU of the device - standard 4" Nexus). If you are having any virtual machines running, suspend them and try again. For me the answer was to set Enable keyboard input to true under the advanced settings of the virtual device. This was the first option I changed on the device, so it is possible that the act of changed an option fixes the error as well based on the wide array of answers above. Note: I've confirmed previously that no VM's are running. Fixed the problem by changing current version of Java within Windows from Java 8 x64 to Java 7 x86. Finally, I found the anwer for this question. I had exactly the same problem and it was completely solved. Virtual device or webcam is rarely the cause of your problem. Just install mainboard chipset driver. I recommend you to use 3DP chipset autoinstaller. For me it was google appengine running locally. Not the answer you're looking for? Browse other questions tagged android android-emulator intel or ask your own question. How to get logs of Android Emulator crash on Mac? 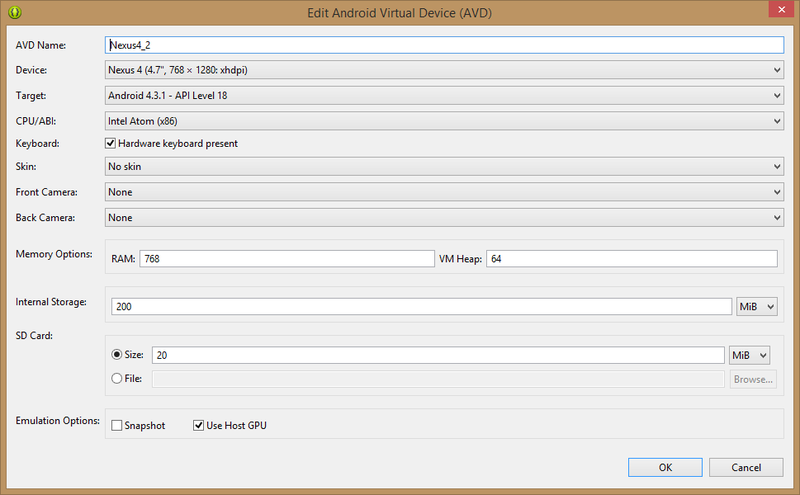 How can I run Android emulator for Intel x86 Atom without hardware acceleration on Windows 8 for API 21 and 19?